CORNERSTONE DESIGNS for AIMEE'S BOUTIQUE -- SUHWEET! STUNNING MULTI STRAND PINK ROSE QUARTZ. This rose quartz is amazing quality and delightfully freeform in size. Wonderful designs by the Lord himself. This will come to you around 17 inches adjustable, or we can change to your preferred length free of charge. DOUBLE STRAND, AND THIS HUGE SPLENDID PENDANT IS a showstopper! Rich and exquisite detail to this stunning raw crystal piece! This will come wirewrapped on necklace in YOUR CHOICE OF GOLD OR SILVER. CACTUS QUARTZ, ALSO known as SPIRIT QUARTZ. Is found only in Magaliesberg, South Africa. It is a quartz crystal that is encrusted by a second generation of smaller crystals grown on its prism, found in amethyst, citrine, and sometime white quartz. Spirit Quartz is an unusual variety of quartz that forms multiple terminated points emerging from a main crystal body. Spirit quartz is found only in Magaliesberg mountains in the Gauteng Province of South Africa and is unique in the colorful drusy covering. The presence of many tiny points covering the body give it a shimmer and glow that is quite beautiful. ABOUT STUNNING, SUGARY DRUZY: Drusy, druse, druzy, drusies - different spellings, but they all mean tiny quartz crystals that form within or on the surface of other stones. When ground water carrying dissolved silica is forced into a porous area of the rock, rapid cooling often occurs, causing the formation of tiny crystals on the surfaces or in cavities of the rock. The clear crystals often form on top of previously deposited minerals. This is called a drusy. Is one of the most desirable varieties of quartz. The pink to rose red color completely unique, unlike any other pink mineral species. The color is caused by iron and titanium. Rose quartz is found in Madagascar, India, Germany and several localities in the USA--including right here in southern California. Much rose quartz was extracted from a famous site near Custer, South Dakota, but now, most of the worlds supply of good carvable rose quartz comes from Brazil. All rose quartz was believed to be only massive, found primarily in the cores of pegmatites. This lack of crystals is somewhat of a curiosity because quartz crystallizes into well formed crystals in all its other macroscopic varieties. So amazing are the rose quartz crystals that the first ones discovered were dismissed as fakes by mineralogists from around the world. This piece was handmade by me with creations from God's earth. My pieces are in boutiques from Tampa to Hollywood (Rhonda Shear / Linda McNair Boutique). Right now I have many creations so it is your chance to get a one-of-a-kind piece for a fraction of the retail price. PLEASE SEE OUR OTHER BEAUTIES IN AIMEE'S BOUTIQUE! AMAZING PINK GEM AND STARFISH PENDANT NECKLACE. CZECH GLASS QUARTZ SHOWPIECE NECKLACE. CHUNKY RAINBOW FREEFORM TURQUOISE NECKLACE. SMASHING TURQUOISE IN aqua AND lime SHADES - BIG. STATEMENT NECKLACE - DRUZY AMETHYST AND AQUA QUARTZ! COLORFUL 3STRAND CORAL AND TURQUOISE GEMSTONE NECKLACE. ABALONE PEARL PENDANT HEIRLOOM PIECE! GENUINE RAW LEMON QUARTZ ON GOLD. AS SEEN AT NEIMAN MARCUS AQUA QUARTZ ICE NECKLACE. GREEN AGATE AND ABALONE SEA OPAL NECKLACE! CORAL PINK HUGE CHUNKY RAW BIG NECKLACE. OVERSIZE REAL SHELL PENDANT FLOWER AND KIWI QUARTZ! REAL STARFISH AND NATURAL QUARTZ. ALL NATURAL DRUZY AMETHYST EARRINGS. PINK GOLD VEIN TURQUOISE PENDANT NECKLACE. SPLENDID DRUZY AQUA BLUE SHOWPIECE - BIG. NATURAL TOP GRADE LAPIS LAZULI NECKLACE. REAL HOUSEWIVES OF NY TURQUOISE EARRINGS - BIG LG. 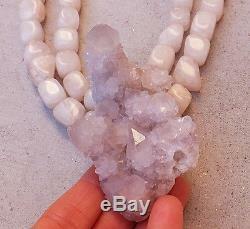 TOP GRADE DRUZY QUARTZ RIBBON NECKLACE. STUNNING TRIPLE STRAND CHERRY QUARTZ! PURPLE DRUZY AMETHYST CRYSTAL GEODE NECKLACE - GLISTENING! OLIVE QUARTZ CHUNKY MULTI STRAND STUNNER! NATURAL PYRITE FOOL'S GOLD NECKLACE!! REAL STARFISH PENDANT 4-STRAND AQUA QUARTZ NECKLACE BIG. DRUZY AMETHYST CRYSTAL PENDANT WITH ROSE QUARTZ. MOST BEAUTIFUL GENUINE AFRICAN TURQUOISE GEMSTONE RING - MANY SIZES! SEPTARIAN DRAGONSTONE DRUZY PENDANT NECKLACE CAMO BIG. PURPLE AND HOT PINK AMETHYST GEMMY DRUZY PENDANT NECKLACE. HUGE TOP GRADE SLAB TURQUOISE NECKLACE - BIG ART < /a>. PURPLE DRUZY PENDANT NECKLACE BIG MO PEARL GEMS. BLACK AND WHITE DIAMOND FINE JEWELRY! SIMPLE LUXURY PINK AGATE BRUSHED SILVER NECKLACE. PINK GENUINE JADE NECKLACE WITH SILVER. HUGE AQUA QUARTZ DOUBLE BRACELET ASA NEIMAN MARCUS! TROPICAL TURQUOISE SHELL NECKLACE XL. MOTHER OF PEARL STUNNER WITH FLOWER PENDANT. AQUA QUARTZ LAYERED MULTI STRAND BIG NECKLACE. ICE CUBE QUARTZ EXTRA CHUNKY NECKLACE. STUNNING HOT BERRY PINK TURQUOISE NECKLACE CHUNKY SHOWSTOPPER. DRUZY PENDANT WITH AGATE AND BRONZE BIG. STUNNING AQUA QUARTZ TURQUOISE COLORED NECKLACE LG. JUICY CITRINE DRUZY PENDANT NECKLACE RAW BIG COUTURE LG. BLUE TURQUOISE AGATE MULTI STRAND NECKLACE. CHUNKY GENUINE TURQUOISE WITH GOLD PENDANT NECKLACE BIG. STERLING SILVER ROSE RING - WOW! CLEAR QUARTZ BEAUTY -- BIG. MOROCCAN DRUZY GEODE PENDANT AND AGATE NECKLACE SILVER. HOT PINK FRANGIA DRUZY GEODE HEART PENDANT NECKLACE BIG. BLUE AQUA MULTI STRAND RHINESTONE FLOWER NECKLACE -- BIG. AMETHYST BOULDER NECKLACE - CHUNKY PURPLE. BIG TURQUOISE MULTI GEMSTONE NECKLACE W SILVER. AMETHYST AND AQUA QUARTZ ICY NECKLACE. MULTI COLORED AGATE FACETED AND STERLING SILVER. GENUINE DELICIOUS ABALONE AND PINK JADE NECKLACE. TURQUOISE COLORED GENUINE JADE TRIPLE STRAND SHOWPIECE. TURQUOISE TOP GRADE CHUNKY MOST AWESOME NECKLACE & lt; /a>. PALE MINT GREEN CHALCEDONY WITH GOLD DETAIL. SHEER BLUE ICY QUARTZ GOLD NECKLACE < /A>. CHUNKY COLOR BLOCKING JADE ON JADE! HUGE GENUINE GOLD DRUZY PENDANT PINK AGATE NECKLACE. GENUINE GREEN DRUZY AGATE NECKLACE GERMAN SILVER BIG. DRUZY AQUA GEODE EARRINGS NECKLACE. HUGE TURQUOISE JADE GUMBALL NECKLACE. STUNNING BRONZE RHINESTONE MEDALLION PENDANT NECKLACE. TOP GRADE OVERSIZED RAW AMBER. AQUA FACETED QUARTZ BIG NECKLACE. CLASSIC JADE GENUINE 3STR GREEN NECKLACE. PINK GOLD VEIN TURQUOISE BIB GEMSTONE NECKLACE < /a>. TOP GRADE STUNNING GENUINE AMBER FRUIT CHUNK NECKLACE. GENUINE LAPIS LAZULI DOUBLE STRAND SHOWPIECE! CITRINE JUICY DRUZY CRYSTAL PENDANT NECKLACE COUTURE LG. RASPBERRY DRUZY AMETHYST AND TURQUOISE - PENDANT BRIDAL BIG. RASPBERRY DRUZY AGATE, PEARL, QUARTZ MEDLEY. TOP GRADE AMAZONITE ROBIN'S EGG GEMSTONE NECKLACE XL. VANILLA CRYSTA MULTI STRAND BRIDAL SHOWPIECE NECKLACE. AMAZING PURPLE DRUZY AMETHYST SHOWPIECE -BIG GEMS. AS SEEN AT NEIMAN MARCUS - AQUA SUGARY GEMSTONE NECKLACE. YUMMY PINK MOCHA AGATE SLAB NECKLACE. RAINBOW GENUINE CORAL CHUNKY NECKLACE. SOFT BLUE AND DRUZY GEMSTONES! TURQUOISE AND RED CORAL GEM NECKLACE SILVER BALI < /a>. RAINBOW QUARTZ MULTI STRAND NECKLACE. ICE DRUZY PENDANT CRYSTAL EARRINGS SILVER HOOPS - RAW BIG GEMS. HUGE CHUNKY LAPIS LAZULI NECKLACE BIG PAGEANT BRIDAL. AQUAMARINE LAYERED GEMSTONES & RHINSTONE PENDANT. JADE DOUBLE STRAND COLOR BLOCKING STUNNER! DELICIUOS FRESH ORANGE TURQUOISE EXOTIC DISKS! PINK MOROCCAN DRUZY PENDANT WITH PINK AGATE < /a>. GENUINE DRAGON TURQUOISE WITH COPPER. PINK CHERRY QUARTZ NECKLACE BIG PAGEANT BRIDAL PARTY! TEARDROP TURQUOISE MULTI STRAND SHOWPIECE! The item "ROSE QUARTZ PINK LOVE NECKLACE DRUZY LAVENDER RAW GEODE CRYSTAL PENDANT EARTH" is in sale since Wednesday, December 28, 2011. This item is in the category "Jewelry & Watches\Handcrafted, Artisan Jewelry\Necklaces & Pendants".